While the many S-100 systems David and I have discussed in the early articles of the History of Personal Computing were formidable computers on their own, there came a time when Joe Public was noticing everything going on around them, and found himself hoping for a convenient, “turn-key” style of home computer. The year was now 1977, and the time had come when certain users wanted computers to simply be there for them, ready to face their purpose head-on, without even a second thought as to why or how they worked. This market demand was met by the first real consumer computers – the “out-of-the-box” micros. This year ushered in three of what were arguably the first personal computers that could be purchased, brought home, taken out of their boxes, setup, and then something productive performed with them right away. At this point in time, two large corporations and one small company with serious investors started to notice a growing trend in personal computing and felt that now was the time to invest in a computer product for the home. These three separate organizations successfully lead the way toward this achievement. All three found a significant level of success, but only one of them still exists to this day, and that was / is an amazing achievement. One company wanted to expand the capabilities of a new and proven low cost CPU. A second computer was designed by and for a well established consumer and hobbyist electronics store. And then a third organization, which we will discuss in this episode, transcended the homebrew hobbyist scene and commercialized a solid, easy-to-use computing platform based on a popular prototype of their own design. That third company was Apple Computer, and in June 1977, they brought the Apple II to market. In future articles, we’ll discuss its competitors and the other two “trinity” consumer computer products. The Radio Shack TRS-80 Model 1, announced in August 1977, then the Commodore PET released in October of that year. The Apple II computer was one of the first home computers that incorporated all of the basic functionality of earlier micros like the S-100 systems into a single space saving case. Not only did Apple put the CPU and RAM together, sharing space on a single motherboard, but you also had additional hardware that provided the BASIC programming language through a built-in ROM interpreter. For $1298, the public was able to get a computer that booted up directly to BASIC where users could start typing in programs for themselves, or type in programs from source code copy that was printed in a magazine or newsletter. Speaking of typing, the Apple II also included a built-in keyboard. There was no more need for an external terminal for typewritten input. In order to remain compact in size, the Apple II did not include a built-in monitor. Although it was best to buy the dedicated monitor made for the Apple II, due to the crisper resolution it provided, it had an NTSC composite compatible video output. If your television set offered a composite video input, you could hook up the Apple II to your TV instead. One last major feature the Apple II had on-board was a simple storage option. All that was needed to load and save programs was an audio cable and a standard cassette recorder. Portable cassette recorders at the time were affordable and common, making it a popular means of saving, loading, and even selling commercial software. Another thing Apple did with the Apple II was to solidify a RAM standard, also practiced by many future computer makers of the day. While some of the S-100 systems may have started with only 1K or 2K of RAM, or whatever amount they felt like installing, Apple provided 4K to start, with the option of adding more by simply by modifying the quantity and type of RAM chips on the motherboard. No expansion card was needed to do a minor RAM upgrade. Anything larger than 16K would require a RAM card to be inserted in one of the Apple II expansion slots. A major difference between the Apple II and its two main consumer competitors . . . it had color graphics! It also cost more than double, but full color was pretty compelling for a computer in 1977. This single feature was the most important upgrade that Steve Wozniak wanted to accomplish over the original Apple 1 single-board computer. So now a little history about Apple. The story of Apple and the two Steves is already very well known in classic computing circles, but here is our take on it. The two principles here are Steve Wozniak and Steve Jobs. Wozniak was almost entirely responsible for the early success of Apple from a hardware standpoint, while Jobs was the driving force behind Apple’s marketing success early on, then for its design and business success from the late 1990s until his death in 2011. Steve Wozniak’s father was an engineer at Lockheed, and he certainly inspired and influenced his son’s curiosity for electronic projects. By the mid-1970s, Steve’s biggest dream was to own his own computer. After realizing that he couldn’t afford a computer and having become a very good engineer himself, in 1975, at the age of 24, he developed the prototype computer that eventually made him famous. Steve Wozniak single-handedly designed the circuit board hardware and operating system for the Apple 1. Steve Jobs, who was five years younger, was already friends with Wozniak, and at Jobs’ urging, the two were capitalizing on the sale of digital blue boxes, a device to make free long-distance phone calls. Jobs was impressed with the Apple 1, and he worked to help Wozniak impress other members of the Palo Alto-based Homebrew Computer Club. Like the blue box, Jobs wanted to sell the Apple 1 as a fully assembled printed circuit board. Wozniak did not really want to do this, but Jobs convinced him that they could at least break-even and tell their grandkids that they had had their own company. They both sold some of their prized possessions, Wozniak’s HP scientific calculator and Jobs’ Volkswagen van, which raised $1,300. With it, they purchased and assembled the first boards in Jobs’ bedroom and later in his garage. Apple Computer was formally established on April 1, 1976 with Steve Jobs, Steve Wozniak and Ronald Wayne as partners. Wayne soon pulled out, and Apple Computer, Inc. was founded on January 3, 1977 with Multimillionaire Mike Markkula providing essential business expertise and funding of $250,000. This was the company and the team which brought the Apple II to market success. 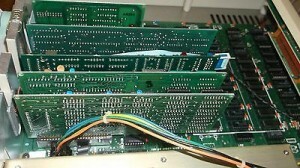 The Apple II had a series of updated and improved models, and many years of market success and profitability for Apple. It wasn’t until the late 1980s that sales of the Macintosh started to equal Apple II sales, and really not until the early 1990s until the Mac dominated Apple’s margins. The Apple II was followed by the Apple II Plus, then the Apple IIe, IIc, IIGS and IIc Plus. 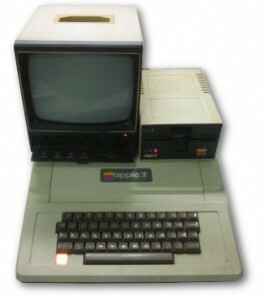 The Apple II Plus was also the first computer to make a significant inroad into the educational market, when Apple partnered with Bell & Howell to sell a self badged, black cased version of the computer to schools. Visicalc, the first spreadsheet, was also the first “killer app.” That is it was the first program available for a microcomputer that became responsible for sales of entire Apple II systems. It played a major role in the success of the Apple II, and for legitimizing personal computers as business tools. Apple II was posted on Thursday, November 27th, 2014 at 12:00 pm. This post is tagged and is filed under 1977, Apple, Desktop Computing, Tier One Computing Devices, Trinity. You can follow the replies through the comments feed. Pings are closed but you can Leave a comment! A Blueberryware theme › 45 queries in 0.390 seconds.